(1) Obtain Blacksmith’s Whetstone by slain monsters, open more chests and strongboxes. 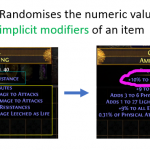 The item level is 1 and can be found in any Act and Map. (2) Using Blacksmith’s Whetstone recipes is also a efficient strategy. (3) Purchase from vendor, such as Greust(The Forest Encampment, Act 2) exchange one Blacksmith’s Whetstone for 3 Armourer’s Scraps. (4) There is a prophecy for blacksmith whetstone as well. (1) Farming Armourer’s Scrap from slain monsters, open chests, and strongboxes. The level of acquisition of the scrap is 1 and can be found in any Act or Map. (2) Tarkleigh(Act1, Lioneye’s Watch) sell an Armourer’s Scrap for a Blacksmith’s Whetstone. 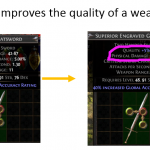 (3) Using recipes to farm Armourer’s Scrap. (4) Exchange other currency to Armourer’s Scrap. (1) Slain monsters are the easiest ways to farm Scroll of Wisdom. When playing path of exile, one has the chance to obtain lots of Scrolls of Wisdom. (2) Vendoring any items for currency. Vendor any low-level item may become Scroll of Wisdom or Scroll Fragment. 5 Scrolls Fragment automatically combine to form a Scroll of Wisdom. (3) Through recipe farming hundreds of Scrolls of Wisdom. (4) 3 The Scholar divination cards can exchange 40 Scroll of Wisdom. (5) Lasting Impressions is a prophecy for 15 Scroll of Wisdom. (1) Upgrades high-value Skill Gems then trade for Exalted Orbs. (2) Farming Exalted Orbs by slain Monsters. (3) Exalted Orb Recipes can farm lots of orbs. (4) Another strategy is farm Exalted Orb Divination Card. 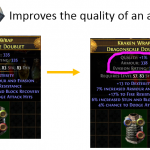 (5) Exchange PoE Items and Currency to Exalted Orb. 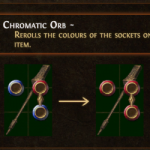 (1) Using Chromatic Orb vendor recipe: vendor an item with one socket of each colour (red, green, blue) linked together. 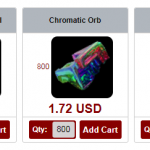 (2) Buy a chromatic orb for 3 Jeweller’s Orbs from Yeena(Act2). (3) Farming Chromatic Orb by slain monsters, open chests and strongboxes. (4) Trade PoE currency and other items for Chromatic Orbs. (1) Farming orb of alchemy by slain monsters. When level your character to 2, you have chance to acquire orb of alchemy. Kill Monsters of higher rarity will obtain higher item level. Open more chests and strongboxes can acquire orbs of alchemy as well. 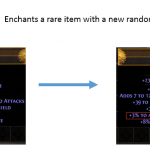 (2) Vendoring unique items to alchemy orb shards, 20 shards will combine to 1 orb of alchemy orbs automatically. 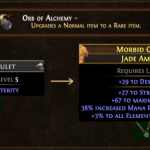 In order to sustain alchemy orbs, pick up every unique items while farming poe currecny. I have farmed hundreds of orbs of alchemy using this strategy. (3) Buy orb of alchemy from Clarissa(Act 3, The Sarn Encampment) for 1 orb of Regret. (4) “The Alchemist” is the prophecy of orb of alchemy. (5) A set of 3 “The Survivalist” can exchange to 7 orbs of alchemy. 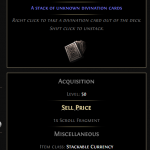 A Stacked Deck is a path of exile currency item that can be used to gain one random divination card. 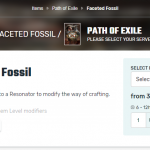 Faceted Fossil is a fossil type of poe currency. 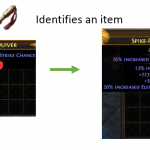 Farming strategies and recipe guides for Path of Exile currency items.